Everyone knows the story of the first real attempt on Mt. Everest. Indeed, a tremendous amount of ink and a tremendous amount of film footage has been generated about the (possibly?) failed ascent of George Mallory and Andrew Irvine. And of course, everyone knows the story of the first ascent. Tenzing Norgay and Sir Edmund Hillary made the first ascent of Mt. Everest on May 29th, 1953. News of the ascent reached London on June 2nd, the morning of Queen Elizabeth's coronation. Everyone knows that story. Right? A lot more modern literature has been written about the Mallory-Irvine ascent than about the Hillary-Norgay ascent. And though the Hillary-Norgay ascent is recounted in volumes of different pieces on modern ascents of the mountain, a lot of the detail is missing. And that's where the documentary Beyond the Edge comes into play. 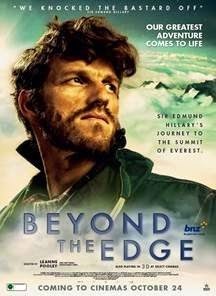 Beyond the Edge tells the story of the 1953 expedition to Everest and the struggles that took place. The following is the synopsis from Rotten Tomatoes. In 1953, the ascent of Everest remained the last of Earth's great challenges. Standing at over 29,000ft, the world's highest mountain posed a fearsome challenge and had already claimed thirteen lives in previous expeditions. Faced with treacherous winds, sub-zero temperatures and battling altitude sickness, Edmund Hillary, a modest bee-keeper and keen mountaineer from Auckland, New Zealand, and the experienced Sherpa, Tenzing Norgay, of Nepal, finally achieved the impossible and became the first men to stand atop Everest. It was an event that stunned the world and defined an era. Hillary and Tenzing carried the hopes and dreams of the United Kingdom, New Zealand, the people of the Himalayas and the entire British Empire on their shoulders. As the world slowly recovered from the horrors of World War II their efforts allowed people everywhere to believe a new age was dawning. The story is told in a similar fashion to Touching the Void and The Summit. In other words, the tale is told using a blend of dramatizations, original footage and photographs. This provides one with the experience of reliving the expedition and all the drama that took place during it. And that's where this film really fills in the gaps. For example, climbing the Hillary Step in 1953 was no different than committing to landing on the moon. You might not come back. In fact, it almost seemed more likely that they wouldn't come back than they would... Making those moves in such an exposed and inhospital place wearing all kinds of oxygen equipment was incredibly daring. Beyond the Edge takes us into the minds of the Everest mountaineers. We live each of their struggles and fears on the mountain. And finally, we rejoice in their ascent to the summit. Indeed, the film is so well done that I would hazard to say that no Everest history buff is complete without a viewing of Beyond the Edge. As of this writing, Beyond the Edge is available streaming on Netflix.